While mother’s own milk remains to be the number one source of nutrition for newborns, there are many instances where breastfeeding may not be possible or sufficient. Honilac fills the gap by providing top-quality ingredients to accommodate all the nutrients required for the most important growing period of an infant’s life. Our Honilac infant formula comes in three stages to provide just the right amount of nutrients babies need in their most important phase of their growth. Our baby Cereals come in seven different flavors and are packed with nutrients and vitamins required for healthy growth of children. Helps babies develop stronger with more added nutritions and vitamins. Our baby teething biscuits come in 5 wonderful flavors. 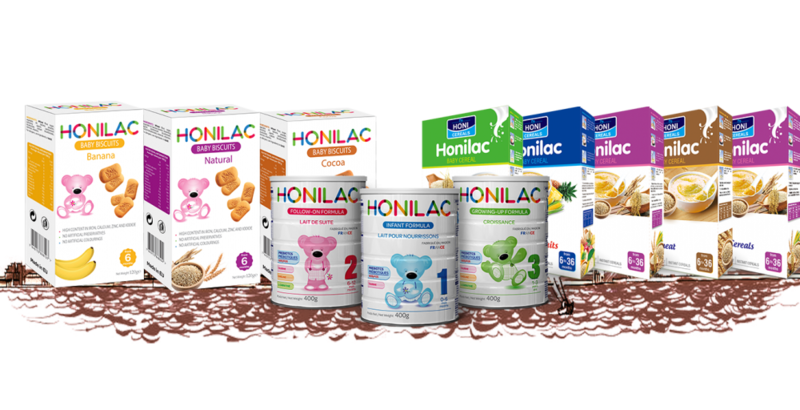 Honilac is a trademark of HONILAC NUTRITION LTD. We are a major producer and provider of infant formula and other nutritional products specifically made for newborns and children of very young age. Honilac is made in Europe under the careful and professional supervision of baby nutrition specialists with many years of experience in this field. We take special care to produce our products in high-sanitary facilities. We make sure nothing undermines the high quality that our customers have come to expect from us. Through many years of our involvement in the international market, we are proud to have been able to cater high-standard nutritional items to you as our valued customer. We strive to help you introduce Honilac into your target market. Please feel free to contact us in any way which is convenient to you. By using this form I agree with the storage and handling of the information I provide by Honilac Nutrition LTD. Copyright 2015 Honilac Infant Formula & Baby Foods, Cereals, and Biscuits. All rights reserved.